Love, Rosie will open in Australian cinemas on November 6 and is distributed by Studiocanal. Now showing in the United Kingdom and due for release in the United States early 2015 (tentative). Based on the bestselling novel "Where Rainbows End"( AKA Love, Rosie ) by Cecelia Ahern, Love, Rosie is an incredibly simple watch but does not lack in enjoyment. As the quintessential chick flick, the film is wildly predictable but makes up for this by being rather charming, fun and comical, along with a beautiful lead performance by Lily Collins. Love, Rosie is a rushed coming of age film blended with hints of romance which is extremely light, but pleasantly so. Rosie (Lily Collins) and Alex (Sam Claflin) have been best friends since they were five years old. As their high school years are coming to an end, the two are seeing other people yet have grand plans to move to Boston together where Alex will study at Harvard and Rosie will study hotel management at Boston College. However, life has other plans for them and a twist of fate on prom night pulls the two apart from their joint destiny. Anyone can see that the two are meant for each, but destiny doesn't seem to be able to put them both in the right place at the right time to stop missing each other. Maybe they are just meant to be best friends who just love each other a tad more than they are supposed to. Love, Rosie is, like the novel it is adapted from, by all means a film tailored for a female audience. It is incredibly easy to watch due to it's simplicity and predictable story which can be quite generic at times, but is very sweet and pleasant. Of course one feels they know where the film is going, but the journey is nevertheless enjoyable. The film covers twelve years in the characters lives in just under an hour and forty minutes so it cannot be regarded as a truly in depth coming of age story as it is obviously rather rushed, but it does give enough for the audience to connect with Rosie and Alex and very much care for the two of them over this period of time. It also addresses issues relevant to young people in modern times such as the pressure to get out there and do something with your life and the feeling of how you must settle for what seems right in the fear that there may not be another chance, which is not always right. Love, Rosie isn't completely unrealistic and is a story about taking the long way around to reach your destiny which many will find relatable. The film doesn't rely on the power of its situations to make it a success, but rather its well written screenplay adapted by Juliette Towhidi which is quite funny and loving. The emotion of the film is rather sporadic with a great deal felt in some moments (such as the funeral), and not enough at others (eg. the impact of divorce). As is a staple in chick flicks, there are some awfully pretty images such as sparkly wedding and party scenes, ice cream and fashionable clothes. The soundtrack is also a lot of fun with songs relevant to the time period in which they are featured, such as "Crazy in Love" by Beyoncé and "F**k You" by Lily Allen. Lily Collins is wonderful as Rosie Dunne. She carries the film with her strength in character and the ability to grow with her as she plays eighteen year old Rosie as well as she does thirty year old Rosie. She is extremely likeable and relatable as when she makes questionable decisions, the audience understands why she has made this decision and sympathizes with her. Collins provides the film with it's most emotional moments and is truly beautiful at these times. Sam Claflin does well as Alex and although his performance isn't quite as strong and emotional as Collins, he is charismatic and likable. Collins and Claflin have great on screen chemistry where the love is felt between the two of them and the friendly manner in which they behave with each other is completely believable. Suki Waterhouse makes only her second film appearance in Love, Rosie and unfortunately isn't completely convincing as Alex's high school flame, Bethany who reappears during the film. On the other hand, Tamsin Egerton, who plays another girlfriend of Alex's, Sally, is completely convincing and does very well in her role. 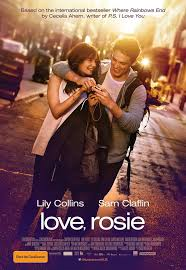 Love, Rosie may be predictable and stereotypical as far as it being a chick flick, but it is a great deal of fun and offers those little differences that allow it to work and make it memorable.